Regression analysis has been one of the most widely used statistical tools for many years, and continues to be developed and applied to new applications. Generalized least squares estimation (GLSE) based on Gauss–Markov theory plays a key role in understanding theoretical and practical aspects of statistical inference in general linear regression models. GLSE can be applied to problems encountered in many disciplines, particularly statistics, econometrics, and biometrics. Provides a self–contained introduction to GLSE. Includes detailed coverage of the ′lower and upper bounds′ approach, pioneered by the authors. Adopts a concise yet mathematically rigorous approach. Includes applications to statistics, econometrics, and biometrics. Contains exercises at the end of each chapter, enabling use as a course text or for self–study. 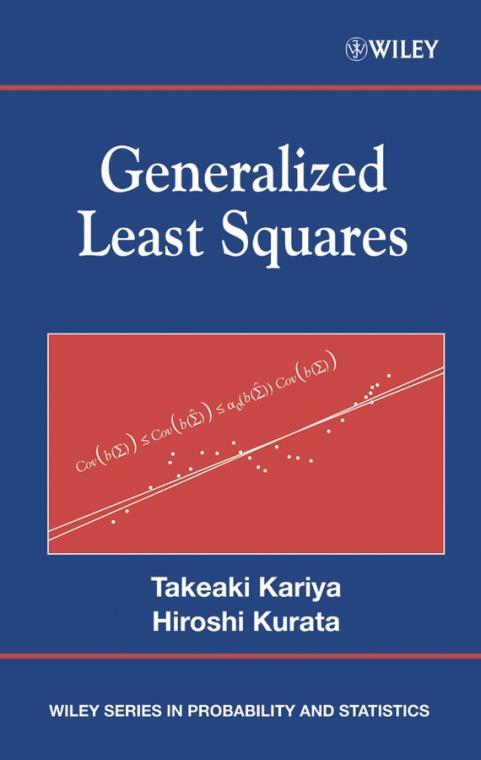 Generalized Least Squares provides an accessible introduction to GLSE suitable for researchers and graduate students from statistics, econometrics, and biometrics. It provides an excellent source of reference, can be used as a course text, and will help to stimulate further research into this flourishing topic. 1.2 Multivariate Normal and Wishart Distributions. 2 Generalized Least Squares Estimators. 2.2 General Linear Regression Model. 2.3 Generalized Least Squares Estimators. 2.4 Finiteness of Moments and Typical GLSEs. 2.5 Empirical Example: CO2 Emission Data. 2.6 Empirical Example: Bond Price Data. 3 Nonlinear Versions of the Gauss Markov Theorem. 3.2 Generalized Least Squares Predictors. 3.3 A Nonlinear Version of the Gauss Markov Theorem in Prediction. 3.4 A Nonlinear Version of the Gauss Markov Theorem in Estimation. 3.5 An Application to GLSEs with Iterated Residuals. 4 SUR and Heteroscedastic Models. 4.2 GLSEs with a Simple Covariance Structure. 4.3 Upper Bound for the Covariance Matrix of a GLSE. 4.4 Upper Bound Problem for the UZE in an SUR Model. 4.5 Upper Bound Problems for a GLSE in a Heteroscedastic Model. 4.6 Empirical Example: CO2 Emission Data. 5.2 Upper Bound for the Risk Matrix of a GLSE. 5.3 Upper Bound Problem for a GLSE in the Anderson Model. 5.4 Upper Bound Problem for a GLSE in a Two–equation Heteroscedastic Model. 5.5 Empirical Example: Automobile Data. 6.2 Uniform Bounds for Normal Approximations to the Probability Density Functions. 6.3 Uniform Bounds for Normal Approximations to the Cumulative Distribution Functions. 7 Extension of Gauss Markov Theorem. 7.2 An Equivalence Relation on S(n). 7.3 A Maximal Extension of the Gauss Markov Theorem. 7.4 Nonlinear Versions of the Gauss Markov Theorem. 8.2 Concentration Inequalities for the Gauss Markov Estimator. 8.3 Efficiency of GLSEs under Elliptical Symmetry. 8.4 Degeneracy of the Distributions of GLSEs. 9 Growth Curve Model and GLSEs. 9.2 Condition for the Identical Equality between the GME and the OLSE. 9.3 GLSEs and Nonlinear Version of the Gauss Markov Theorem . 9.4 Analysis Based on a Canonical Form. A.1 Asymptotic Equivalence of the Estimators of in the AR(1) Error Model and Anderson Model.